Apfel Funeral Home in Grand Island originated in 1907 as Miller O’Gorman Furniture and Undertaking located at 315-317 West Third Street. In 1909, the name and ownership was changed to Fralick-Geddes Company. Gavin Geddes and sons, Glenn and William returned to Grand Island from farming in Martin Township and joined son, John, to purchase Charles Fralick’s interest. Geddes and Company was established on October 27, 1911 continuing the business of furniture and undertaking. Gavin Geddes resided as president with John Geddes appointed secretary and Glenn and William Geddes serving as undertakers. The business remained at 315-317 West Third Street expanding in the early 20's to include furniture, a chapel and undertaking. Gavin Geddes retired in 1924. The Geddes and Company was closed in 1927-28. Mr. Gavin Geddes died on November 5, 1928. On February 1, 1929, Glenn and William Geddes reopened and relocated Geddes Funeral Home to 615 West Third Street (the M.L. Dolan home) which is where Eakes Office Plus is now located. On May 1, 1933 they moved to 209 East Second Street. On February 1, 1949 the partnership was dissolved and Glenn Geddes continued alone until May 1, 1959 at which time he sold the business to R. E. Apfel of Wood River and Don and Floyd Butler of Hastings. It was then reorganized as Apfel-Butler-Geddes Funeral Home. 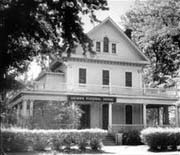 The funeral home moved to it's current location, 1123 West Second Street celebrating the grand opening on February 22, 1966. It was at that time it began under the management of Gaylord D. Apfel. Mr. Apfel retired in 1996. Gaylord continued helping with funeral services and with his activities in the community. The firm was purchased by Derek Apfel on April 1, 2004 from the Butler family as well as his father, Raynord Apfel. Derek is now the sole owner of Apfel Funeral Home, with locations also in Wood River and Cairo. The firm celebrated it's 100th year in business in 2007 with an open house and luncheon. The Apfel family looks forward to another 100 years of service to Grand Island and the surrounding communities.